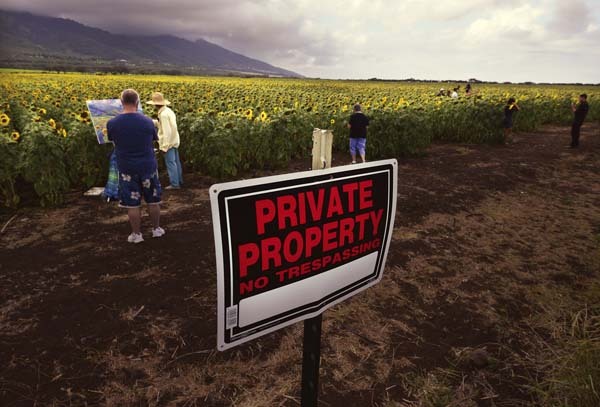 “No Trespassing” signs have been posted around Pacific Biodiesel Technologies’ experimental crop of sunflowers on 14 acres near the intersection of Honoapiilani and Kuihelani highways. The signs were installed to try to keep away people attracted to the blooming yellow flowers for photos or even to steal or deface them. The state Department of Transportation has put up “no parking” signs near the sunflower field on Honoapiilani and Kuihelani highways. Motorists have been parking on the shoulders of both roadways, creating a safety hazard. 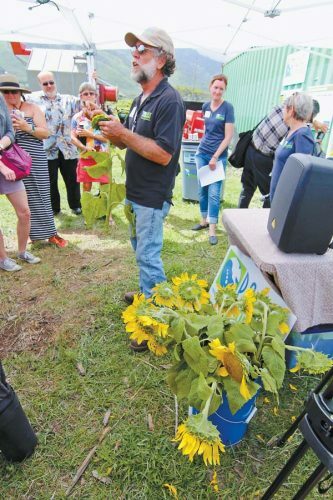 Pacific Biodiesel Vice President Kelly King, who also holds the Maui County Council’s South Maui residency seat, said that, initially, there was a lot of excitement when the sunflowers bloomed weeks ago. Eighty-five percent of people were “very respectful,” she said. “But there were a few rotten apples who’ve been stealing flowers, pulling flowers out by the roots . . . carving happy faces in the flowers. Bystanders tried to help police with tracking down sunflower thieves, taking and posting photos of them, she said. But there’s been an escalation in thefts. Access to the property has been restricted for safety reasons, said Kim Sloan, Pacific Biodiesel’s spokeswoman. “It’s a working farm,” she said. King said that the number of people visiting the field has grown dramatically. “It’s escalating,” she said, adding that traffic hazards are a concern. News coverage of the pilot project has fueled public interest in the sunflowers to the point where it’s gone “viral,” Sloan said. A review of Facebook and Twitter shows numerous postings for “Maui sunflowers,” she said. 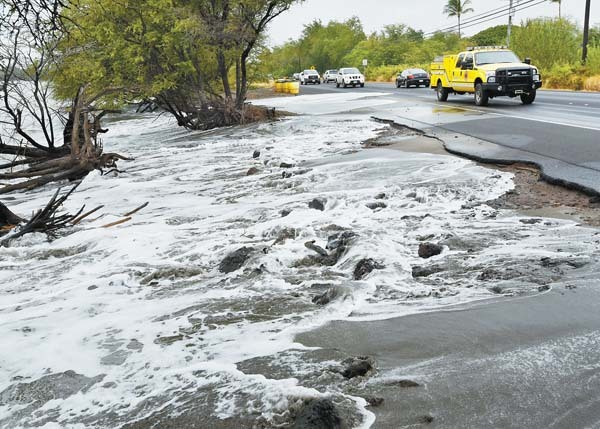 Someone called Pacific Biodiesel from the Four Seasons Resort Maui at Wailea to say guests had inquired about booking their vacations around the bloom of sunflowers, she said. “Obviously, we don’t want people cutting flowers,” she added. King said there’s been misinformation about the project, an experiment in growing sunflowers for oil to produce biofuel. The flowers are not genetically modified organisms, she said. And the project is not using pesticides or harmful chemicals. The first crop has been grown without irrigation, only rainwater, King said, adding that the company will use irrigation in the future but that water demand is expected to be only 15 to 25 percent of what’s historically been needed for sugar cane. In a month or two, the current crop of sunflowers will reach the end of its life cycle and turn brown, King said. The blooms will dry out and hang over, apparently as a way for the plants to protect their seeds against birds. In June, the crop will be harvested. The seeds will be crushed for oil, she said. And other parts of the plant will be used as feed for livestock or possibly using the leaves as a food source for people. The field is expected to yield 100 gallons of oil per acre, according to the company. Another crop of at least 14 acres is being planted at a nearby field, she said. Pacific Biodiesel has leased 115 acres for sunflower cultivation from property owner Waiale 905 Partners, which is headed by Maui Tropical Plantation owner and developer Mike Atherton. The next field will bloom in 1¢ to 2 months, King said. “We’re definitely going to try to figure out a way to maintain control” of public access to the site, she said. Pacific Biodiesel aims to produce 32,775 gallons of biodiesel annually from sunflowers. Because biodiesel burns cleaner than petroleum diesel, biofuel prevents 295 tons of harmful carbon dioxide emissions from entering the atmosphere, according to a company fact sheet. On its Facebook page, the company said it would explore agri-tourism events and educational tours in the future. On Saturday, the company will host a free Earth Day event at the sunflower field, Sloan said. All of the more than 300 reservations have been claimed. A waiting list has been started. 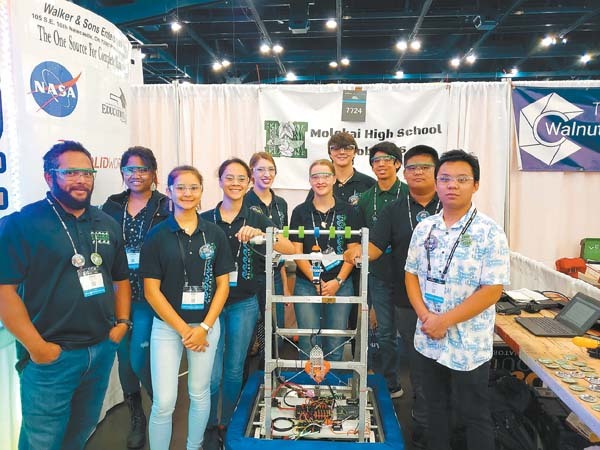 Two buses, both running on biodiesel, will shuttle visitors from the Maui Tropical Plantation to the site, she said. “We don’t want to make it worse,” she said. Several local musicians will donate their time to perform during the event, she said. For more information about the company, go to www.biodiesel.com.